To All the Aspiring Dancers Who Want to Increase Their Flexibility But Do not Know How Nor Where to Start! Even If You Barely Come to Tie Your Shoes"
There must be some reason why some dancers are visibly more flexible than others. Many keep asking me how to improve their efforts into the stretching, wherever I go ... dance schools, gyms, young professionals in Italy and abroad ... Don't you feel your legs, for example, hurting after spending a long day standing, walking or dancing? Then You Will Be Happy to Know That Your Total Relief It is Only at the Distance of a Click. Keep Reading to Discover How You Also Can Learn to Perform Targeted and Effective Stretches In the Areas Where You Need to Improve Your Technique! However, I am not Sylvie Guillem, so if you're looking to reach her level you'd better take a look elsewhere. Imagine for a moment how it would be if you stopped feeling pain when you raise the arabesque or cramps while stretching your feet. Imagine how it would feel if your leg à la seconde got up a good 20% more than usual... Imagine what joyous life would be without sprains due to the weakness of the intrinsic muscles of the feet! The good news is that dreaming to dance so aesthetically strong and flexible is not just a fantasy - but it MAY happen. And all you have to do to leave behind you weak and sore feet, low legs en dedans and even a lack of stability, is focusing on the aspects of stretching that sculpt and prepare the muscles to get the results you want. This is what I do and recommend to practice before and after the dance lessons. The printable worksheet will also help you keep a record of your progress. strengthen specific muscles and ultimately their dance technique. You will be able to read an interview in which a little known secret on how to gradually stretching safely and effectively is revealed, with always better results. A valuable experience shared for free to you, and to all those who seek strategies that really work! Which features would you like to see in a report specifically designed for your needs? I want a guide to strengthen my feet. I want a solution to raise the arabesque without suffering from back pain. I want to raise my legs à la seconde, rotating them well without inflating the quadriceps. What would make it easier for you to achieve results quickly? I need to be able to stretch every day from home. I need to rapidly increase the opening of the hips to improve my dance technique and properly stabilize the posture. I need to optimize my schedule due to my extracurricular commitments. I need to lift my legs enough to perform the variation X in the competition Y without giving a bad impression, within a couple of months at most. I need new effective strategies ready to be included in my dance lessons and stretching sessions. If You've Ever Wished You Could Learn How to Raise Your Legs and Move As A Professional, You Are in The Right Place! Introducing "38 Targeted Stretches For A Dancing Body at a High Standard of Performance", the only series of do-it-yourself exercises containing revealed secrets for a maximum outcome! But you do not only get somebody's strategy: you will get 38 ideas from the artistic journey of the biggest names in dance known worldwide! In Just 30 Days From Now you Could Be Stronger, Reactive, Aligned and Flexible! Kneeling on one leg, slide down as much as possible from the position of the picture remaining strictly with both legs parallel and never en dehors. 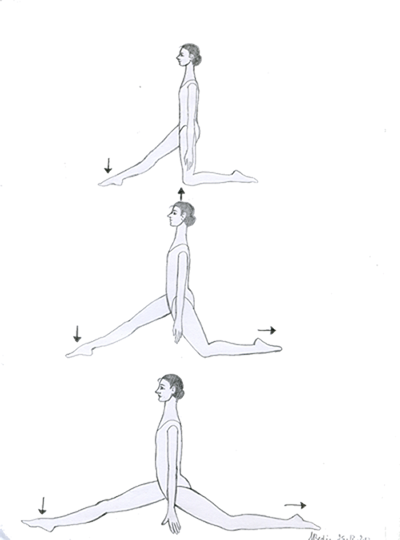 The bust is extended upward, your feet are pointed. The front foot always remains still and fixed on the floor, so try to slip backwards only with the one behind. You'll even learn how to TEACH them! Finally Here is Your Guide Without Fluff, Fillers or Ballasts to 100% Revolutionize THE Quality of Your Stretching! 1. But... what is a targeted stretching? You work in a targeted manner when you understand how to isolate specific parts of the body as much as possible to enhance their performance, either actively or passively. Combining more targeted stretches, you'll get excellent results! 2. Can you show me an example of targeted stretch? Watch in this video how to lift the arabesque by resisting the uphill of the leg behind! 3. How can I start getting the results you've always dreamed of with your manual? Start identifying the points that need a reinforcement according to the improvements you want to get, choose a pair of targeted stretches and after a dance lesson stop at least two minutes on each of them (per leg or foot, if they involve the limbs separately). Listen to the voices of those who have already experienced my solutions! "Alessandra is amazing! She is doing a dance intensive at my home studio this week and wow...it was the best ballet class I've had. She has such a wealth of knowledge of how the body moves and how to isolate specific muscles. She also has the most amazing stretches. I was being stretched, but I loved it!" ''The Best 38 Resources That Every Dancer Should Use''! But are only these ones the resources that I use and recommend? Certainly NOT. So my highly recommended resources don't end here: follow me and stay tuned in order to access the WDA Membership! Furthermore, if you order by Christmas, I will be more than happy to give you a Floor Bar at your choice completely FOR FREE! Hurry up, the Bonus' offering expires at midnight on 24th December! P.S. Order now "38 Targeted Stretches For A Dancing Body at a High Standard of Performance" to put your hands on deep and effective strategies, and starting to see the results right today! P.S. 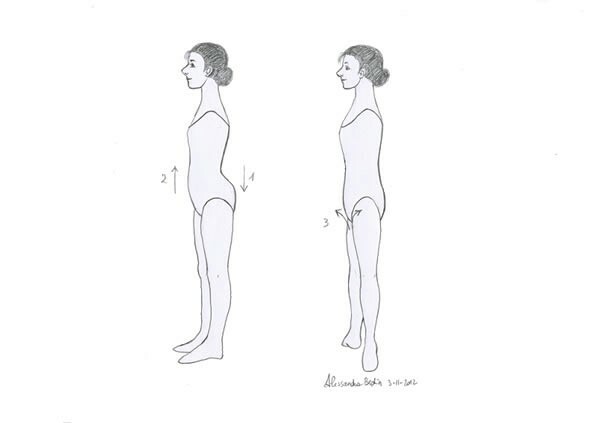 Remember, when ordering the manual "38 Targeted Stretches For A Dancing Body at a High Standard of Performance" you will also get the 1st report on "Asana" postures, suitable to relax and loosen your muscles... completely for free! And if you arrive on time, you win a Floor Bar at your choice: soft or strong! • PS. Moreover, by following my Newsletter you will discover the video tutorials of those same stretching exercises FOR FREE!